Field Touring Alpine Blog: FTA Broad Peak 2012 - C2 Established, C3 up next! FTA Broad Peak 2012 - C2 Established, C3 up next! 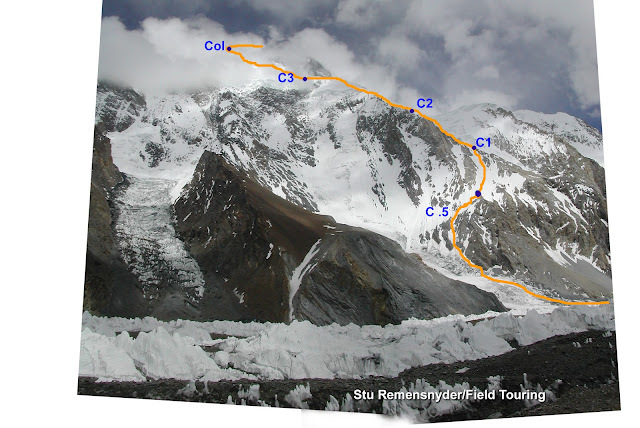 Our team has made great strides in the last 3-4 days having now established and occupied camp 2 at 6250m. They will take the next few days to rest up back at base camp and then make a push to establish and sleep in camp 3 at 7100m which will prepare them for a summit bid. Ben called in to let us know everyone was well and that they were looking forward to an evening of movies and a long sand well deserved sleep after 2 night nigh on the hill. We expect a full report on the effort in the next 24 hours along with new images from Brad Jackson. Brad's reports from the days leading up to the latest push and images are below..enjoy! June 30th - Rest day at Base Camp and return of the remainder of the team. Louis popped his head in around midday and then the rest of the team came in over the next 2 hours and those of us who were rested may have expressed an evil smirk as we witnessed members arrive in in various states of exhaustion from their return of tagging Camp 2. At breakfast, three of our members, in a in a bout of patriotic fever sang the first 2 words of their national anthem before losing interest and leaving the rest of us to eat our porridge and eggs in peace. Ben and I did a grand tour of the Broad peak base camp and met for the first time a 4 member Taiwanese team and a returning Polish climber – Pavel. We had morning tea with the remainder of the French team and were impressed with the hospitality and friendliness. Those guys are Chamonix guides and not requiring fixed ropes but were still willing to help out..Merci beaucoup. Unfortunately it looks like FTA is providing the vast majority fixed rope and manpower on this mountain and Ben and I spent much of the day calculating rope requirements. 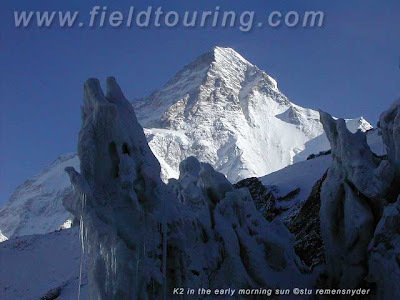 At lunch, Al and Mat returned from their foray to K2 base camp and reported some disarray as it appears that some of the climbers there are waiting for a ‘big team’ to fix lines on either the Cesen or Abruzzi routes. The rest of lunch was spent eating of course and organizing ourselves for our first night to sleep at Camp 2. The basic outline of the next couple of days is as follows. Louis, Grace, Matt and Arnie will climb to Camp 1 and rest on the 2nd July. The remainder of the team to spend an additional rest day and then Al and Darren go to camp 1 and Ben, Hamza and myself to try and make camp 2. The days following hopefully will be spent sleeping at camps 1 and 2 and then making our way to base camp before forecast snow and winds appear on the mountain on the 5th/6th July. This evening we watched ‘The Dictator’ on Zeeshan’s wonderful Sony laptop and Polish Pavel joined us in the tent for the evening’s entertainment. We were finished by 8pm in time for the first group to get some decent sleep before their 4am departure. FTA Broad Peak 2012 - Summit push is on! FTA Broad Peak 2012 - Summit Bid Brewing! FTA Broad Peak 2012 - C3 established! FTA Broad Peak - C2 reached!